Download the PDF of the report. A relentless series of destructive extreme weather events last year has staggered farmers and taken a toll on state governments around the country. From Hurricanes Harvey and Irma hitting parts of the south to droughts and wildfires in the Midwest to heatwaves in the West, farmers and rural communities are struggling to recover. State governments are finding themselves on the front lines of responding to climate change, including the immediate and long-term effects on agriculture. These climate-related effects drain state government budgets and cause enormous financial and emotional harm to farmers and rural communities. The severity of climate-related impacts will depend largely on how our farming systems respond to changes in local conditions. Climate adaptation plans, when implemented, can lower costs for local governments and lower risks for farmers and agriculture-related businesses—and potentially create new markets for businesses and farmers. The urgency to act on climate change is leading governments and businesses all over the world to develop climate adaptation plans. At the international level, the Intergovernmental Panel on Climate Change (IPCC) recommends that climate adaptation planning be place- and context-specific, with no single approach for reducing risks across all settings. In the U.S., the National Caucus of Environmental Legislators (NCEL) has been a leader in promoting state-based climate adaptation, because no two states or communities will experience climate change in exactly the same way. 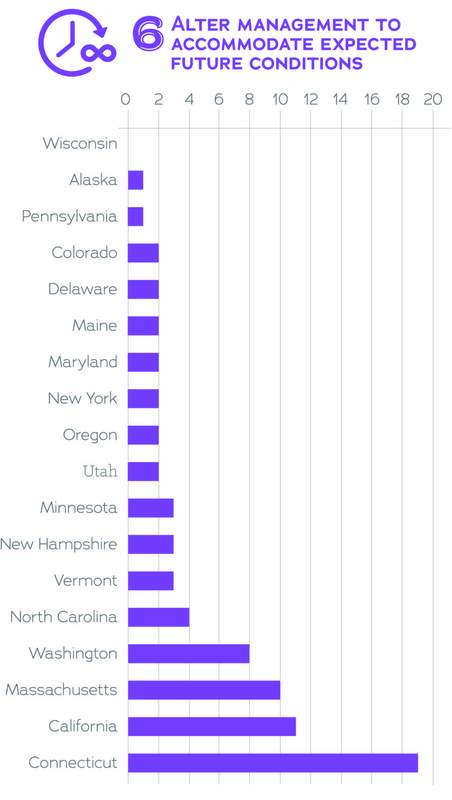 Unfortunately, too many states don’t have climate adaptation plans and those that do often do not include agriculture. 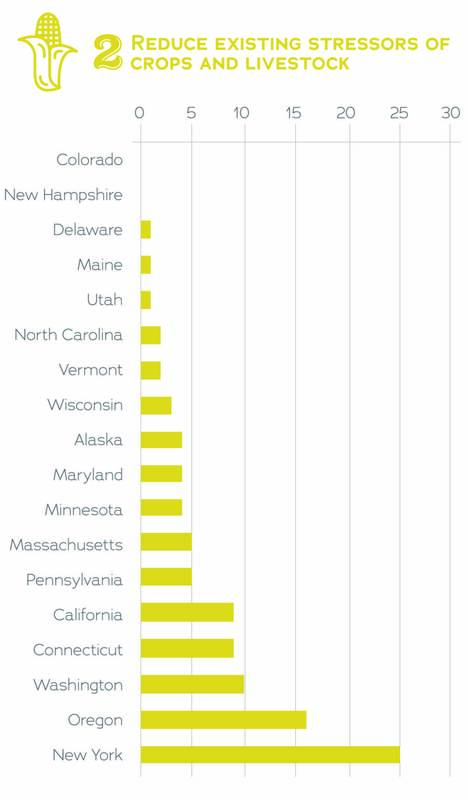 Currently, only 18 states have climate adaptation plans that include agriculture. Of those 18, recommendations on agriculture are too often general and aspirational, disconnected from the policies or resources required to follow-up on and implement them. There are also some exceptions and examples of truly innovative thinking at the state-level that other states can learn from. In this paper, we analyze how state climate adaptation plans treat agriculture and food systems, identify challenges and best practices and lift-up innovative approaches for the future. To conduct the analysis, we cataloged every state with a climate adaptation plan that makes concrete recommendations for agricultural adaptation. We created a list of every agriculture-related policy proposal in each state plan and sorted those strategies into ten categories based on our best interpretation of their goals. 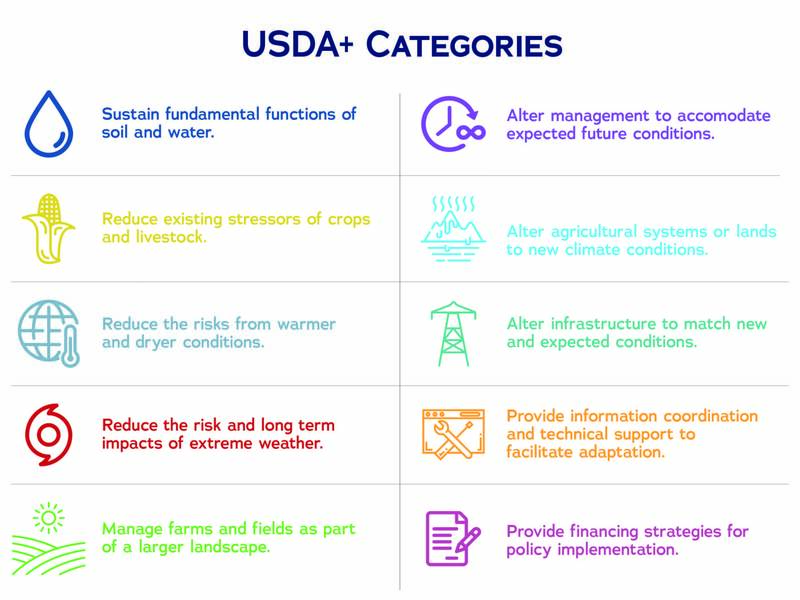 We pulled from eight strategies identified by the USDA in the 2016 report “Adaptation Resources for Agriculture,”2 and added two additional categories we identified as important, covering financial support and technical assistance. A few important trends stand out in state climate adaptation plans. Few states are considering ambitious changes to their agricultural systems, such as changing crop types to fit the altered climate or using new approaches to animal production. Locally focused adaptation strategies with less daunting scopes, such as those focused on soil and water quality, have gained traction. Strategies designed to support farmers with technical and financial support for climate adaptation are well-represented. Very little attention is given to biodiversity, how to “manage farms and fields as part of a larger landscape,” a potentially powerful tool in the face of climate change. Investing in agriculture-related infrastructure as part of climate adaptation is similarly under-represented. There is an implementation hurdle after adaptation plans are written. Adaptation plans can transition directly from the writing process to the shelf if not supported by state agency action and policy. Adequate financial resources and institutional support mechanisms are needed. To ensure a successful and just transition to climate resilient agricultural systems, resources and support must be available. Farmers often operate on razor thin profit margins, making independent adaptation action difficult. States are not ready to include strategies that involve the significant altering of agricultural systems to new climate conditions. Careful thinking and planning on these bigger issues will be necessary for future climate adaptation plans. Political resistance to climate action must be overcome. States should increase engagement with farmers and rural communities as partners in adaptation planning now. Taking the time to ensure farmers are engaged early on and have input in the development of climate adaptation plans is essential to a successful plan. States that lack adaptation plans entirely need to begin preparing. 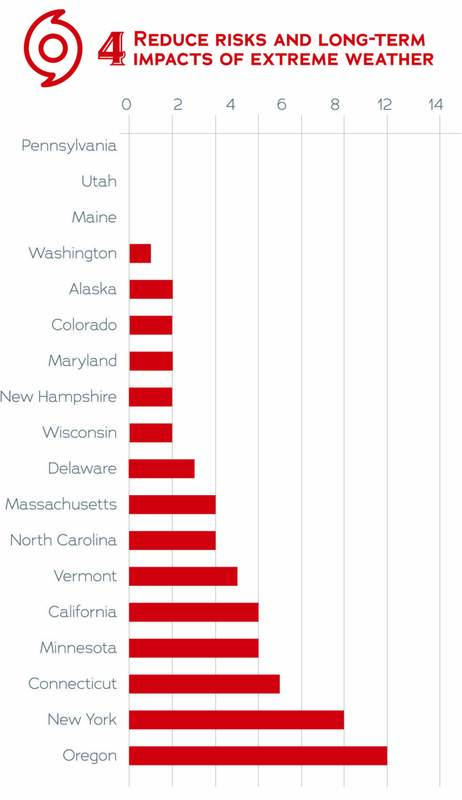 As the costs of inaction on climate adaption rise, states will be forced to start planning. The weather events of the last year highlight how states that continue to ignore climate adaptation will end up paying the price. Farmers in every state are dealing with a variety of climate-related changes, some immediate and others long-term. States can learn from past experience, and each other, by engaging with farmers and rural communities to build climate resilience into future planning. The risk of pressure from pathogens and parasites of livestock may rise. These climate-related risks are in addition to other challenges farmers face, including volatile markets that often pay below-cost-of-production prices and increased corporate concentration that is leading to diminished competition in most agriculture sectors. The severity of climate-related impacts will depend largely on how our farming systems respond to changes in local conditions. These responses, whether short-term or long-term, are climate adaptation strategies, and, like most strategies, they are stronger if part of a larger, coordinated plan. Climate adaptation strategies for agriculture could include adjusting planting patterns, using more resilient crops, or changing livestock management. Shifts in weather patterns, the timing of pollination and precipitation will require shifts in agricultural production—with different crops being affected differently. While innovative farmers may adapt in the short-term, over the long-term, more transformational strategies focused on resilience in agricultural systems will be needed. Those strategies will have to be supported by a new, broad-reaching policy framework that includes farm financing and credit, research and technical assistance, insurance and conservation programs and other rural development initiatives. Part of withstanding weather disruptions is the ability to withstand them financially. Climate risk will be added to the other risks, particularly economic, that farmers already face. At a very basic level, climate adaptation plans help prepare for the future. Many researchers view agricultural climate adaptation as a series of actions that begin by addressing short-term, immediate needs and build toward more transformational changes over time. Activities can fall into two areas: managing production within the existing system and managing the changes that are coming, including changes to the system. Both strategies can exist simultaneously. Climate adaptation plans should help lower costs for local governments, lower risks for farmers and agricultural-related businesses and possibly create new markets for businesses and farmers. These types of plans can be done at the community, regional, state or national level. And they can be done by individual businesses or within sectors. Significant co-benefits, synergies and trade-offs, exist between mitigation (greenhouse gas reduction) and adaptation. Consistent with this call for regionally focused strategies, states are uniquely positioned to act on climate, particularly in the case of agriculture-related climate adaptation. Farming is literally dependent on the local and regional geography, and as a result, policy and strategy frameworks for climate adaptation must be built from the ground up. Many climate adaptation strategies have multiple benefits, such as soil health improvement, water quality protection, wildlife habitat management or greenhouse gas mitigation. For example, the use of cover crops can help increase carbon sequestration, while strengthening adaptation. The use of tree cover for livestock can also help sequester carbon. But a “policy by policy” approach can be disjointed and fail to build upon larger synergies and strategies. Broader climate adaptation plans offer the opportunity for meaningful engagement with farmers and the rural communities where they live. Stakeholder participation in the development of climate adaptation plans is essential. Stakeholders know the landscape and local economy and can assess whether a proposed strategy will work in the community without unintended consequences. Perhaps most importantly, stakeholder engagement is critical because they are the citizens who are most affected and whose help is most essential to ensure implementation. 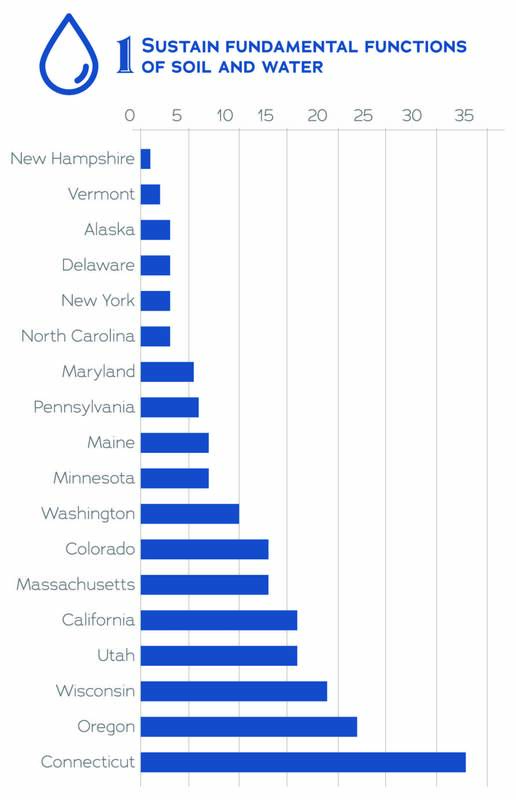 Unfortunately, too many states don’t have climate adaptation plans. 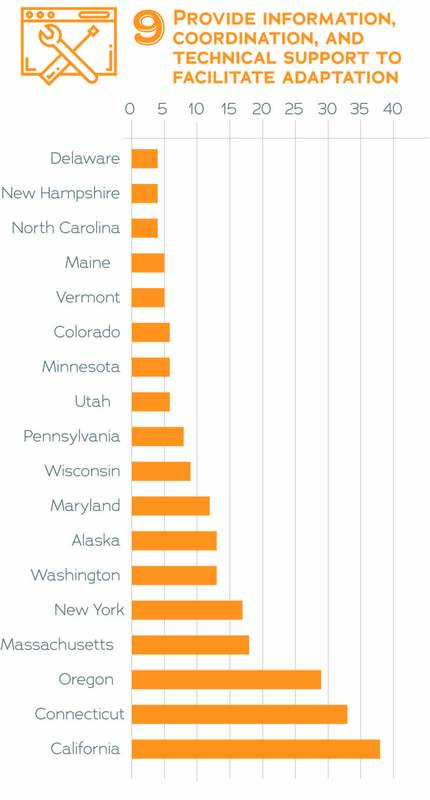 And those that do often do not include agriculture; currently only 18 states have climate adaptation plans that include agriculture. Of those 18, many include only very general recommendations that are disconnected from policy or the resources for state agencies to follow-up on and implement them. There are also some exceptions and examples of truly innovative thinking at the state-level that should be more widely adopted. In this paper, we analyze how state climate adaptation plans treat agriculture and food systems, identify challenges and best practices, and lift-up innovative approaches for the future. 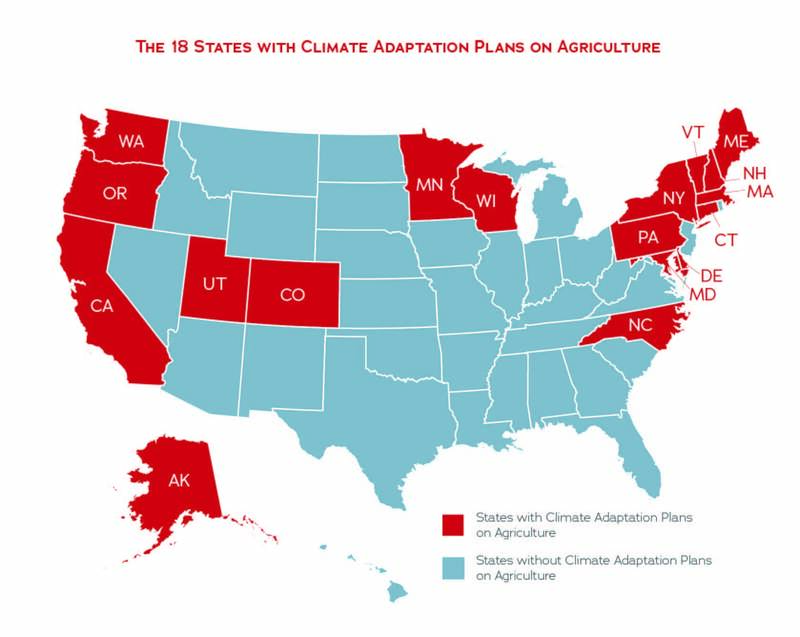 To conduct the analysis, we cataloged every state with a climate adaptation plan that makes concrete recommendations for agricultural adaptation (18 states in total). Then, we created a list of every agriculture-related policy proposal in each state plan, and sorted those policies into ten categories based on our best interpretation of their goals. This categorization revealed the type and number of adaptation strategies recommended by individual states and what strategies are most commonly identified among states. A few limitations to this evaluation approach should be noted. First, in cataloguing the state plans, all recommendations within their “agriculture” sections were included. We also included recommendations in other sections that referred to food or agriculture. Second, it is difficult to compare policy proposals across states as they can differ greatly in scope and specificity. We have partially accounted for this by allowing broad policies to be counted in multiple categories, but there is still uncertainty in how broader policies will be interpreted and implemented. As a result, the quantitative results of this paper should not be understood in overly specific terms. They provide useful insight into which sectors of adaptation the states are pursuing and which they are not, but should not be taken as exact measures for comparing different categories, or for comparing different states. Furthermore, because of climate variation between states, gaps in certain categories will be more significant in some states than in others. A third challenge is that most of these plans are voluntary, so there is great variation in how they are implemented. The goal of this paper is to analyze how comprehensively each state’s climate adaptation plans address agriculture-related climate adaptation challenges, but the existence of a plan does not mean it will be implemented well. Fourth, the term “climate adaptation plan” itself is subjective. For example, some states have climate adaptation plans that do not pay significant attention to agriculture, but they may have other agriculture-specific policy papers. In such cases (e.g. Vermont), we used the agricultural adaptation policy paper. In other cases (e.g. 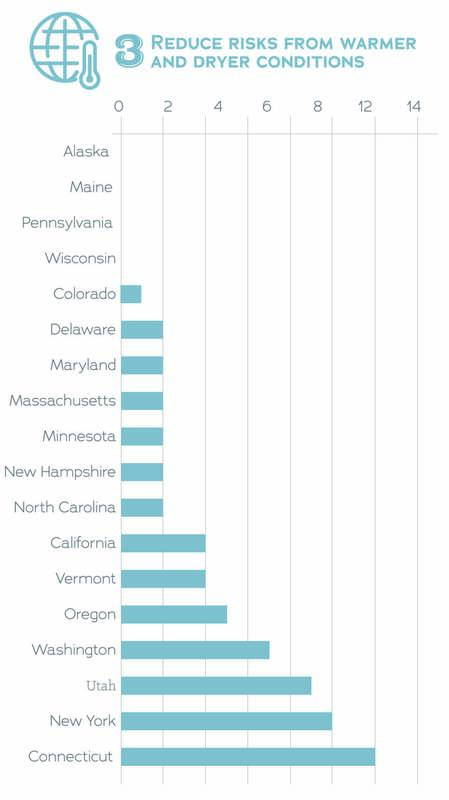 Wisconsin), states produced reports that were not technically “climate adaptation plans,” but which evaluated the dangers posed by climate change to the state with suggestions of adaptation polices noted. We counted such reports in lieu of a full climate adaptation plan. Finally, several states suggest adaptation policies for fisheries management. Because fisheries management is not a part of the USDA categories, and because it only applies to the few states in which fish are a significant aspect of food production, we decided not to include it as its own category. Instead, we added a note crediting each state that included fish related policies. A. General trends among the 18 States. In our analysis of climate adaptation plans, a few important trends stand out. Few states are considering ambitious changes to adapt their agricultural systems or lands to new climate conditions. Strategies to shift farming systems, including new crops, to new climate conditions were rare or non-existent among states. These large-scale, transformative changes will be needed in the long run, but, possibly due to their cost, complexity, and scale, they are absent in most adaptation plans. Locally focused adaptation strategies with less daunting scopes have gained traction. For instance, strategies for preserving soil and water quality, recommendations that offer tangible, short-term benefits to agricultural production and can be implemented by each farm independently, were included in every plan. The two strategies designed to support farmers with technical and financial support for climate adaptation are well-represented in state adaptation plans. Solutions such as institutional and technical support and coordination policies, had the highest average number of recommended strategies per state. 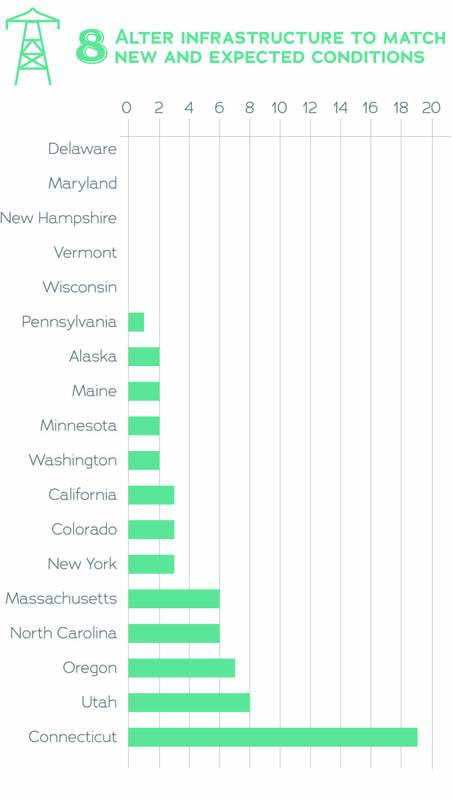 Programs related to financial support hold the third highest average number of recommendations per state. The ecosystem benefits provided by preserving native habitats and biodiversity will be a powerful tool in the face of climate change, but they are being largely ignored by states. 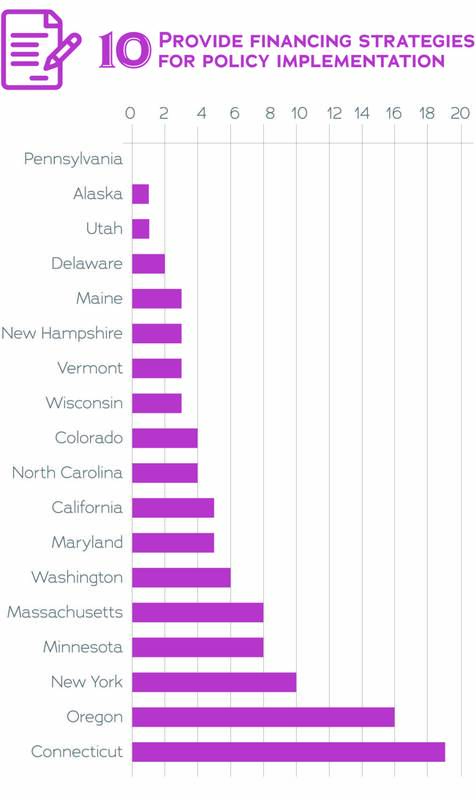 Infrastructure is similarly under represented. Rural infrastructure overall is already woefully underfunded, and agriculture-specific infrastructure is no exception. 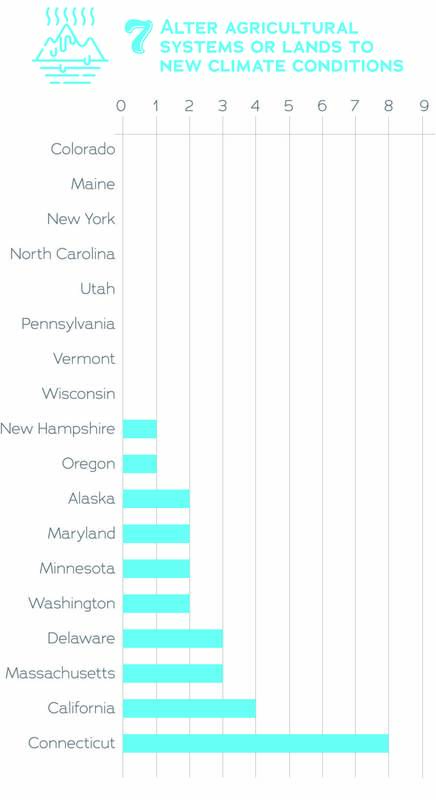 Most states had few strategies related to agricultural infrastructure and climate adaptation. There is an implementation barrier after adaptation plans are written. The Alaska and Wisconsin experiences reveal how quickly an adaptation plan can transition from the writing process to the shelf if not supported by state agency action and policy. California provides an example of a plan that was implemented well and has successfully monitored its progress. Adequate financial resources and institutional support mechanisms must be provided to ensure a successful and just transition to climate-resilient agricultural systems. Farmers often operate on razor thin profit margins, making it difficult for them to independently undertake climate adaptation. Though our analyses found consistent and promising attention to financing strategies, the need for additional support is apparent. States are not ready to include strategies that involve the significant altering of agricultural systems to new climate conditions. Political resistance to climate action must be overcome. Though this problem goes far beyond the scope of agricultural adaptation, states should increase engagement with farmers and rural communities as partners in adaptation planning now. Farmers and rural communities are often more open to discussions on climate adaptation than mitigation. Taking the time to ensure farmers are engaged early on and have input in the development of climate adaptation plans is essential. Farmers have knowledge that is essential to a successful plan, and they are, after all, experts on implementation. States that lack adaptation plans entirely need to begin preparing. 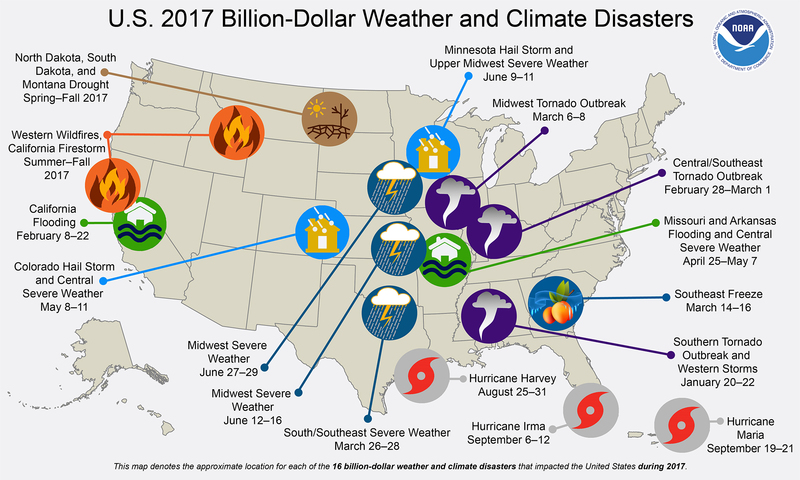 As the last year’s weather events highlight, states that ignore climate adaptation will end up paying the price. Farmers in every state are dealing with a variety of climate-related changes, some immediate and others long-term. States should learn from past experience, and each other, by engaging with farmers and rural communities to build climate resilience into future planning. There are some good models and initiatives out there to guide the bold action that is needed. Alaska’s Climate Change Strategy: Addressing Impacts in Alaska (2010)36 was produced by the Alaska Adaptation Advisory Group for the Alaska Department of Environmental Conservation. The plan is strong on fisheries management but does not include most other USDA+ categories for climate adaptation. It does give substantial attention to institutional support (9) for the few types of policies proposed, but does not mention drought preparedness (3) or biodiversity (5) and barely covers preparing for extreme weather (4), altering agricultural management and systems to accommodate future climate conditions (6 and 7), infrastructure improvements (8) and financing (10). Pest management (2) receives some attention but not a substantial amount. The proposed policies in Safeguarding California: Reducing Climate Risk (2014)39 by the California Natural Resources Agency makes up a strong plan for agricultural adaptation. The plan is a follow-up to California’s already completed climate adaptation actions identified in 2009. Its main weaknesses are in altering infrastructure (8) to match expected climate conditions, drought preparedness (3) (especially surprising considering the long drought California was experiencing at the time of the report), and altering entire agricultural systems as the climate changes (7), a particular problem for a major agricultural state deeply reliant on an unstable water supply for large monocultural fruit and vegetable farms and mega dairy operations. California’s plan is unique among the states in that it is the second comprehensive adaptation plan in a series. Because of this, it includes sets of policy recommendations that have already been completed and as such were not included in this paper. Studies of the ability of California’s beneficial species to control new or worsening invasive species problems. The Invasive Species Council of California has created a strategic framework to guide adaptation to invasive species. The California Department of Food and Agriculture has, through a USDA Specialty Crop Block Grant Program, funded climate adaptation research on cropping and agricultural management. Heat and agricultural worker safety standards have been strengthened. Resource Conservation Districts have been set up to control runoff and erosion. Many of them offer mobile irrigation labs to monitor and improve irrigation efficiency and generate awareness of water conservation among the agricultural community. The Colorado Climate Plan (2015)44 by the Colorado Department of Natural Resources includes recommendations for agricultural adaptation that are strong when it comes to maintaining soil and water health (1), and fairly represented on institutional support (9) and financing (10). It contains no policies concerning increasing risks from pests and weeds or for protecting livestock from increasing temperatures (2). Risks from extreme weather (4), preserving biodiversity (5), altering farm management (6) and infrastructure (8) receive only cursory mentions and only as they are related to water quality. Altering agricultural systems (7) receives no attention. While information sharing and grant programs have been successful, the Colorado Climate Plan has lacked the resources, in staff and funding, to make those programs widespread. Furthermore, while individual producers tend to be open to new adaptation practices, some farm groups are more resistant to change and skeptical of the need for climate adaptation. The Connecticut Climate Change Preparedness Plan (2011)48 by the Connecticut Department of Energy and Environmental Protection is an impressive, comprehensive set of policy recommendations in every category and in fisheries management. There is still room for improvement, particularly in adapting to pests (2) and extreme weather (4), but even those sections are very solid compared to many other state plans. It also includes some unique policy recommendations covering such issues as supporting young farmers and extending visas to increase the labor supply for longer growing seasons. Research how to get more young farmers interested in farming in CT” and “Make more affordable in-state tuition for college agricultural programs. Grow berries in a modified greenhouse approach or high tunnels [and] Use drip irrigation. 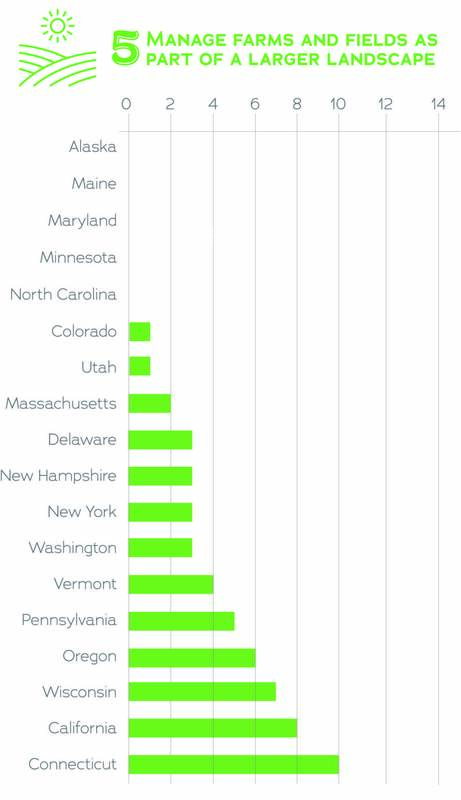 Connecticut has a particularly well-rounded set of recommendations for financing adaptation. This is a sample of its policies in several important sectors of financial support. Reduce producer risk in the transition to new crops/breeds, infrastructure and production management through: loan guarantees, cost share, farmer research groups, crop insurance and new conservation practices. The Climate Framework for Delaware (2014)49 by the Delaware Department of Natural Resources and Environmental Control has at least one policy recommendation in every category other than infrastructure (8). Most policies are characterized as preliminary recommendations to consider further policy options, for example for water conservation or farm management (1 and 6), educate the public on the negative effects of climate change (9), or preserve habitats (5). It does briefly note necessary fisheries adaptation. Maine’s climate adaptation plan, People and Nature: Adapting to a Changing Climate – Charting Maine’s Course (2010)50 by the Maine Department of Environmental Protection provides a considerable number of recommendations for water conservation (1) and pays some attention to institutional support (9) and financing (10). It provides few recommendations for pests and diseases (2), preparing for a warmer climate or extreme weather (3 and 4), biodiversity (5), or altering agricultural systems (7), and only two proposals each for altering farm management (6) and updating infrastructure (8). The Comprehensive Strategy for Reducing Maryland’s Vulnerability to Climate Change – Phase II: Building Societal, Economic, and Ecological Resilience (2010)51 by the Maryland Commission on Climate Adaptation and Response does not devote much space to agriculture. As with many other adaptation plans it does well on institutional support (9) and decently on funding (10) and water conservation (1). Otherwise, its proposals for pests are adequate, and its proposals in every other category are either minimal, as in heat and extreme weather preparedness (3 and 4) and altering agricultural management and systems (6 and 7), or nonexistent, as in the case of biodiversity and infrastructure (5 and 8). Massachusetts’ Climate Change Adaptation Report (2011)52 by the Massachusetts Executive Office of Energy and Environmental Affairs and the Adaptation Advisory Committee primarily emphasizes soil and water (1) and institutional support (9). It also offers a robust set of strategies for financing adaptation (10), infrastructure (8), altering farm management (6) and fisheries management. The Massachusetts Adaptation Report’s major gaps are in altering agricultural systems to cope with the new environment (7) and in biodiversity (5). Adjust seasonal labor pools. Consider the need to shift from seasonal employment to alternate labor pools should longer warm seasons preclude labor pools dependent on academic calendars or shifting harvest seasons. Investigate providing technical and financial support to assist small farms to bring produce to new markets, particularly in urban areas. This may include support for participation in community-supported agriculture by low-income families. …Promote and provide/increase technical and financial support for small-scale farming. … [and]Evaluate the opportunity to provide disaster assistance or insurance for small farms for crop losses. Adapting to Climate change in Minnesota (2017)53 by the Minnesota Interagency Climate Adaptation Team provides a good set of water conservation policies (1) and, in proportion to its proposals for the other policy categories, an impressive set of financing proposals (10). Sections on pests (2), extreme weather (4) and institutional support (9) are thin. It offers few recommendations for soil health, adapting to warmer temperatures or altering farm management and larger agricultural systems and fails to mention the benefits of biodiversity to agriculture. Food Safety Rapid Response Team: Consisting of technical experts in food manufacturing, food inspection, microbiology and epidemiology, this team can verify the safety of stored food products after a disaster. The New Hampshire Climate Action Plan (2009)55 by the New Hampshire Department of Environmental Services Climate Change Policy Task Force provides a few recommendations each for financing (10), improving biodiversity (5) and altering farm management to accommodate expected climate changes (6). Its recommendations for informational and technical support (9) are thin compared to most other state plans; it has little to say about water conservation (1) and preparation for extreme weather, and says little on soil health (1), pests and diseases (2), altering agricultural systems (7) and infrastructure improvements (8). The New Hampshire plan uniquely contains several proposals about limiting urban sprawl to preserve agricultural land. The New York State Climate Action Council Interim Report—Adaptation Technical Work Group Recommendations (2010)56 is impressively strong in some categories. It contains comprehensive sets of recommendations for adaptation to new pests and diseases (2), adaptation to increasing temperatures and more prevalent extreme weather (3 and 4), institutional support (9) and funding (10). It has little to say about soil and water conservation (1), adaptive farm management (6) or altering agricultural systems (7) and completely neglects infrastructure (8). Climate Ready North Carolina: Building a Resilient Future (2012)57 by the North Carolina Interagency Leadership Team provides adequate recommendations in a few categories, most notably infrastructure (8) but also to a lesser extent funding (10), extreme weather (4) and farm management (6). Otherwise it makes only a few recommendations each for soil and water conservation (1) and increasing temperatures (3), while pests (2) are only mentioned briefly. Biodiversity (5) and altering agricultural systems (7) are not mentioned at all and institutional support (9) received far less attention than in almost any other state plan. The Oregon Climate Change Adaptation Framework (2010)58 by the Oregon Climate Change Research Institute makes an impressive total number of policy recommendations. Sections on pests (2), technical support (9) and financing adaptation (10) are comprehensive. The report makes exhaustive recommendations for water conservation, but pays less attention to soil conservation (1) and similarly recommends plenty of adaptation strategies for extreme weather (4) but little for increasing temperatures (3). The related topics of altering farm management (6) and agricultural systems (7) to changing climate conditions receive only cursory mentions. Outside of our categories, fisheries management receives some attention, and the report uniquely suggests that Oregon collaborate with the Centers for Disease Control and Prevention to prevent the spread of non-native pests and diseases. Lead a statewide summit on invasive species and co-host, with Washington, Idaho, and California, a regional summit on invasive species. … Develop policies that help limit development and post-disaster reconstruction in hazard-prone areas. The Pennsylvania Climate Adaptation Planning Report: Risks and Practical Recommendations (2014)59 by the Pennsylvania Department of Environmental Protection provides policy recommendations for a few categories: soil and water conservation (1), pests (2), biodiversity (5) and institutional support. It includes only one recommendation each in the infrastructure (6) and improved farm management (6) categories and does not mention funding (10), warmer and dryer conditions (3), extreme weather (4) or altering agricultural systems (7). Additionally, three suggestions are made for protecting fisheries. Drought in Utah: Learning from the Past, Preparing for the Future (2007)60 by the Utah Division of Water Resources is unique among state adaptation plans in that it actively presents itself as a drought plan. As expected, the plan proposes a strong set of policies for water conservation (1), adaptation to increased temperatures (3) and water related infrastructure (8). Those policies are bolstered by some institutional support (9). Financing adaptation (10), biodiversity (5) and improved farm management (10) receive only token mentions. Pests (2) and altering agricultural systems (7) are not included. The plan includes unique suggestions to prepare for drought such as connections between water banks to distribute load and other methods of increasing cooperation and water distribution. Vermont’s Climate Change Adaptation Framework (2013)61 does not include substantial recommendations for agriculture, but the state had previously produced an agriculture-focused adaptation document: The Potential Impacts of Climate Change on Agriculture in Vermont (2010). The 2010 report is unique among state adaptation plans in that it is focused entirely on adaptation for agriculture, rather than climate adaptation generally. It provides some recommendations for adapting to warmer and extreme weather (3 and 4) and biodiversity (5) and offers possible policies in every other category with the exception of policies to alter agricultural systems and upgrade infrastructure. Outside of these categories it does make some noteworthy proposals to support family farms and local food systems as adaptation strategies. Preparing for a Changing Climate: Washington State’s Integrated Climate Response Strategy (2012)62 by the Washington State Department of Ecology makes recommendations in every category. It is strong on soil and water conservation (1), pests (2), improved farm management (6) and technical support (9) and additionally provides at least a set of recommendations for funding (10) and adaptation to warmer weather (3). This is contrasted by only light attention to extreme weather (4), biodiversity (5), altering farm systems (7) and infrastructure (8). The Plan also notes the importance of local food and preventing the conversion of agricultural lands to urban development. Wisconsin’s Changing Climate: Impacts and Adaptation (2011)63 by the Wisconsin Initiative on Climate Change Impacts has a huge variance in its attention to adaptation in each category. Soil and water conservation (1) is covered in detail, while adapting to warmer weather, altering farm management (6), altering agricultural systems (7) and improving infrastructure (8) are not mentioned at all. Technical support (9) and biodiversity (5) receive a solid amount of attention, while pests (2), extreme weather (4) and funding (10) are barely noted. The Plan also includes recommendations for preserving fisheries including very specific recommendations for different fisheries around the state. Build a stronger relationship with the public to establish a critical mass of ecological knowledge in the community. Assemble oral histories photos, records, and studios to document previous conditions and present them to the public. Brian J. Wienhold, Merle F. Vigil, John R. Hendrickson, Justin D. Derner. “Vulnerability of crops and croplands in the US Northern Plains to predicted climate change.” Climate Change. May 23, 2017.